Salzburg and Vorarlberg and 262 alumni. The scholars share a determination for their own education, are socially committed and have an outstanding personality. They participate in social/community activities or perform volunteer work in their schools. the courage to take these challenges and actively shape their own lives and the world in which they are living. purpose. We also encourage scholars to network with each other and with the START-alumni. The nonprofit association START scholarships Austria (ZVR.392068267), based in Vienna, holds the ownership of the START scholarship program in Austria. START is currently represented in Vienna, Vorarlberg, Salzburg, Lower- and and Upper Austria. 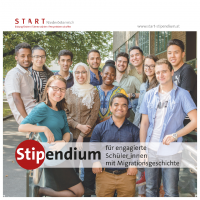 The START Scholarship Program is a officially recognized education and integration program for committed pupils with an immigration background in Austria. 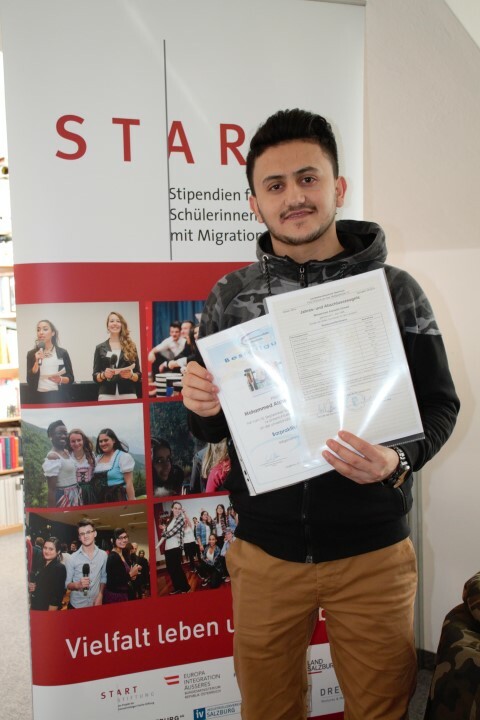 About 67% of the scholarship holders came as a refugee with or without family to Austria . This demands an increased requirement of support to help these young people, integrating themselves in the Austrian society and education system. START focusses on individual potential and wants to support particularly dedicated and determined pupils to integrate into Austrian society and graduate from high school. The 118 active scholarship holders and 262 dedicated alumni/ae have their roots in more than 50 nations. Together they form the START Austria Community in the federal states Vienna, Vorarlberg, Salzburg ,Upper Austria and Lower Austria. Vision of this funding program is an open, socially permeable society, who experiences diversity as enrichment. Who is supported by START? • improve the opportunities of capable and determined pupils with migration background. • encourage gifted and dedicated pupils to aim for a higher education. • enable these pupils to focus on school. • improve the conditions and accessibility for an academic career. • open doors into professional management positions. • highlight the example set by fellows for others. • qualify the fellows to mediate between the different groups of people / prospects in a migration society. • activate and reflect the intercultural skills of fellows, make this potential visible for the whole society. • contribute to a chance in perspective concerning the often negative discourse on immigration / migration in Austrian society. • enable and empower young people to participate actively and thereby shape our society. • build a stable network of mutual support among the fellows, supporters and partners of START that stands for anti-discrimination, respect and a focus on potential rather than deficits. • inspiring Austrian society to be more open, transparent and equitable. START is not a classical refugee care organization; we support pupils with migration background coming from low-income families. But 67 % of our current fellows already are refugees, numbers increasing every year. START is not only an educational project but also an integration project and in parts a social project. Every graduated START-Fellow can join the START-Alumni Association, a non-profit network of students and young professionals who have come together to engage in Austria. As graduates of the START-student scholarship program, they understand the Alumni as a voice for young dedicated people with an immigrant background. The aim is to highlight the positive aspects of a diverse, cosmopolitan Austrian society. In this sense they are trying change the image of young immigrant people in a positive way. Another concern is to promote dialogue between the Austrian majority population and young adults with a migration background. START Alumni not only wants to build bridges between cultures but also between generations.